As usual, voting and nominating will take place via the website and if you don’t fancy running but you know someone who might, be sure to use our suggest a friend button at http://www.susu.org/making-a-difference/elections/2013/. The Postgraduate Research and Taught Officers will work together to coordinate and organise events and activities for postgraduate students at Southampton. This role works to support SUSU’s aim of developing our students’ commitment to and involvement in our activities. As Outreach Officer you will work with work to ensure that SUSU activity and services are accessible to students that are studying at our satellite sites, eg Basingstoke, Portsmouth, Isle of Wight. 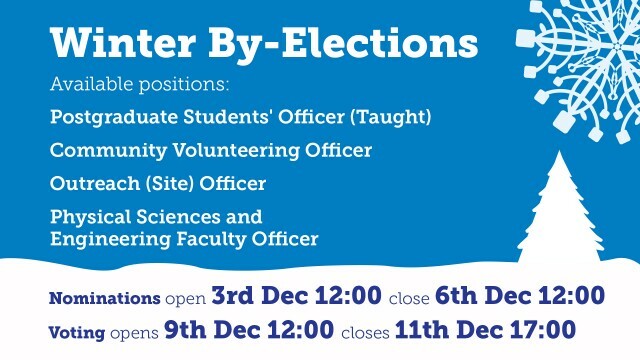 You will represent the interests of students locally and within the University and Union. This role involves the co-ordination of the relevant student academic representatives, working with the aforementioned representatives and the VP Academic Affairs to represent student views to the University. It would suit you if you are passionate about representation and education quality, someone with good listening and communication skills and someone with ideas about how your course could be improved.